This tallit that I wear is a very special tallit. It is made from fabric that was brought back from Senegal by my daughter Rachel, who lived in Africa most of this past year. I did a lot of research beforehand, deciding which methods I would use to complete it. For example, I chose to make the corners – which are usually extra squares of fabric – out of a special fold of the material itself. Holes had to be made in the material for the tzitzit – it had to be pierced and then bound up so that it would not fray. It is adorned with tzitzit – fringes – that I tied myself. I chose to tie the tzitzit according to some ancient traditions: for example, I used a blue thread on each corner, a tradition that was largely abandoned with the fall of the second Temple, but is seeing a new revival. I recited the traditional prayers as I tied the knots, and followed the Sephardic tradition of knotting, which gives each corner a spiral effect, both beautiful and, for me, reminiscent of DNA. You might say I was involved in tikkun tallit. For tikkun is a word that means several things in Hebrew: To repair. To adorn. And to complete, but a special kind of completion – a completion that means a transformation. I repaired the tallit by binding up the hole that was made for the tzitzit. That was important, but by itself, repairing the hole would not have been enough. 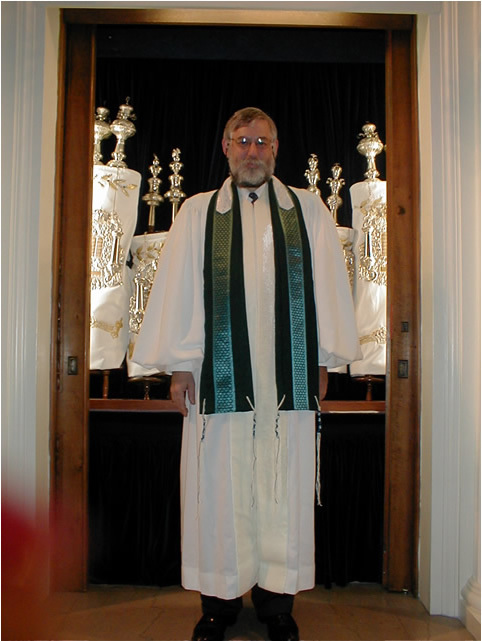 I adorned the tallit with the tzitzit. But had I only hung fringes from it, had I only adorned it, it would not have been enough. I completed the tallit by ritually tying the tzitzit, transforming it as I worked from a long scarf into a holy object. In a sense, it was the whole process of tearing, binding, adorning and completing the tallit that is at the heart of its transformation. As it says in Leviticus Rabba, We are healed by the very wound that is inflicted upon us. Now, as you know, this tallit carries a great deal of meaning for me, and the beginning of that meaning is that my daughter selected the material for me during her year abroad. But it is not simply that it was purchased in a foreign land, and delivered over a great distance by someone I love. Rachel was in Africa for her Junior year, pursuing a degree in international relations. She went there expecting to take courses in the local schools, as well as to gather information for her senior thesis. You see, she wants to understand how women participate in the economy, so she decided to follow the course of fabric from its manufacture thru the creation of products to their sale or exchange in the marketplace, for it is fabric that is truly in the domain of women there. In the process of gathering this information, Rachel had to learn a new language so that she could communicate with the average woman. She spent time in the marketplace, eventually working for one of the vendors, helping her trade her wares. She went out into the "bush," visiting cotton producers and their societies. But most importantly, she encountered first hand the stark difference between affluent America and impoverished West Africa. She learned what it was like to be in a minority determined by skin color, to be truly second-class on the basis of gender, to be absolutely different and foreign because of her religion. Rachel was wounded by her travels, in that her fabric of understanding and expectations was pierced by the sharp realities of this very different world. The transition back to our home, to our country, was and is painful, and she has had to learn how to bind up her wounds in novel ways. But had she only found ways of coping with the return, it would not have been enough. She returned adorned with new tastes in music, food, and dress. But of course, by itself, that adornment would not have been enough. Rachel has been transformed by the experience, in that a new fire has been ignited within her, a fire to work for a better world. Now, her life is richer, as is her future. Truly, Rachel is being healed by the very wound that was inflicted upon her. She is growing into a new, stronger, and more committed woman because of the painful experience, not despite it. She is, herself, engaged in tikkun Racheil . But it is not only objects that can undergo the process of tikkun, nor only individuals. A year ago I helped start a group that began as a creative writing class for adults at our local high school. When the class was over, we did not want to disband, so instead we decided to meet every month and share our writing. Slowly, the group grew to include other budding writers, and as the bonds between us grew, we shared more and more personal material. A couple of months ago we thought it would be nice to gather up some of our writing into a chapbook – a simple collection of self-published essays, poems, and artwork. We couldn’t imagine anyone ever buying it, though, for what we write is far from high art, and a long way from commercial. It was then that one of our members – Kathy – came up with an idea. Kathy’s sister has a granddaughter, Maddie, who was born with lissencephaly. Lissencephaly is a condition in which the contours of the brain are missing: instead of having folds, she has a smooth brain. It means that, in all likelihood, she will lead a severely limited life, never developing beyond the 3-5 month old level. Most children like her die before they are two, some live more than a decade. Her family prays for a miracle, and strength. Kathy suggested that we bring our best writing, whether it was something already written or newly-conceived, to a chapbook dedicated to Maddie. Perhaps there would be an interest in it, perhaps it could be used to raise some funds for Maddie’s parents, who – because she has dozens of seizures a day – never get a break from their care giving, whose financial state deteriorates every day. Soon it was clear that we were engaged in something much more than a fundraiser: we were demonstrating to Maddie’s family that their community extended further than they had ever imagined. And we were helping Kathy – and each of us – struggle with the tragedy that Maddie’s condition presents. "How could this happen?" we asked ourselves. "What can average people do in the face of such a challenge? How are we, as family, as friends, as acquaintances, moved by Maddie? What difference will her shortened life and brilliant smile make?" We are engaged, individually and as a group, in tikkun chaverai – the repair, adornment, and transformation of our group. It would have been kind, perhaps, if we had simply supported Kathy, given her our empathy, voiced our care and concern. But it would not have been enough. It would have been nice, perhaps, if we had simply agreed to write about Maddie, to collect our writings and give them to the family, adorning their lives with the meager art we can create. But it would not have been enough. In order to be enough, to be truly transformative, we will have to tell our stories, enlarge our circle, and wrestle together with the issues that are stirred up for us. Will the chap book ever be written? I hope so. But I know that in the process of trying we will bring a true tikkun to us as a group, and hopefully to Maddie and her family. We will be healed by the very wound that is inflicted upon us. And so, now, on to the obvious: September 11th. September 11th pierced our souls in a deep, lingering way that we as individuals, as a community, as a nation are still coming to terms with. I have seen more damaged souls, more aching spirits this year than I can ever recall having seen before. I cannot ascribe it to mere coincidence. I have come to the conclusion that the terrorists who struck at us a year ago hit more than our buildings, took more from us than the thousands of lives that were lost. I believe that they wounded us more deeply than many of us are ready to acknowledge, or are able to recognize. And I believe that until we as individuals, as a community, as a nation begin to engage in the full process of tikkun, we will not truly heal. And worse, we may allow the pain of that wound to drag us down, rather than lift us up. Now, not all of us have experienced the same level of disruption, the same level of challenge, the same level of injury; some of us have managed to escape apparently unscathed. But how many of us know someone who no longer wears the same smile for the checkout cashiers; how many of us know someone whose wounds of the spirit have not healed in this past year the way they normally would have? So, in order to accomplish this tikkun, what must we do? First, we must start to bind our wounds, individually and collectively. We must acknowledge between and among us that we live now in a different world, a world that is less safe than it used to be. We now live in a world where we can recognize the economic hardships of others, hardships for which we cannot fully blame the terrorists, despite their hand in accelerating the demise of an economy that was too good to be true. We must reach out to each other – and especially to the disenfranchised – and offer our understanding and support, letting them – and ourselves! – recognize that safety diminished does not mean security lost. We must demonstrate to each other – and ourselves! – that we can both give and receive the strength that we need to begin to heal. We must be careful, however, not to confuse strength with the abuse of power, not to seek security by attempting to control others, rather than engage them. The anger that rises in each of us from time to time must not be used as an excuse to purge our fear by frightening others, whether it be a skirmish in the office or a truly frightening war against foreigners born out of political expediency. When we are able to reach out to our family, our friends, and our community, and when we are able to be reached by them, then we will have begun our repair. But, by itself, this will not be enough. We must also learn to adorn ourselves again, in humor and light and joy. Far from the grim lesson of living each moment as if it is our last, we must re-engage ourselves in the pleasures of this world. "Pleasant sounds, sights and smells put one in good spirit," the Talmud tells us. In fact, we are obliged to enjoy life; for we are also reminded in the Talmud that we will be called to account in the hereafter for each enjoyment we declined in this world without sufficient cause. And so, our tikkun must include the adornment of our lives, and our spirits. But that, by itself, will not be enough. For a complete tikkun, we must allow our lives to be transformed. We cannot look back to the days before September 11th and say, "if only we could go back." We must look forward to the new futures that lie before us, imbue them with strength and joy and spirit, not dwell on what was and cannot be again. We must engage ourselves with our families, our communities, and our world in ways that move us to a brighter future, not allow ourselves to languish in the past. We must accept the fact that our lives have been changed irrevocably in ways that are sometimes too painful to recall, and yet can give us the energy to create a new world. Then we will truly be engaged in tikkun olam – healing, adorning, and transforming the world. A new tallit. A tallit that I wrap around myself – like the arms of a loving parent, to comfort and heal me. A new tallit. A tallit full of light and life, that sparkles with bright whiteness and shimmering darkness, that adorns my life, and my spirit. A new tallit. one that was transformed by prayer, and now leads me to transform my world. Come. Let us be healed by the very wound that was inflicted upon us.